have well and truly spoken.Abbondanza Italian Restaurant, winner of "The People's Choice" Award for Favorite Italian Restaurant in Key West for many years, invites you to enjoy the charm of our Old Town location. 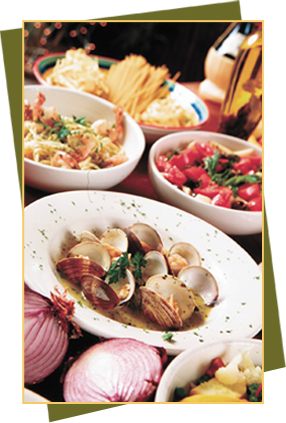 Abbondanza Italian Restaurant is Key West's favorite Italian dining spot offering an extensive selection and friendly local atmosphere. Seating is on a first come, first served basis. Reservations are accepted for large groups. Three cigar-makers cottages were converted to make up the three atmospheric dining rooms where large parties can be easily accommodated. The dress is Key West casual and the atmosphere is cozy, relaxed and fun. Abbondanza Itialian Restaurant has been the recipient for many years of the People's Choice Award for the best Italian Restaurant in Key West. Abbondanza Italian Restaurant is located in the heart of Old Town Key West, Florida. Couples, friends and families alike enjoy the warm and inviting ambiance of our dining room and fun local energy of our bustling full liquor bar. With a friendly, attentive staff, and a wonderful wine selection, Abbondanza Key West is a neighborhood Italian restaurant that wins over locals and visitors alike.